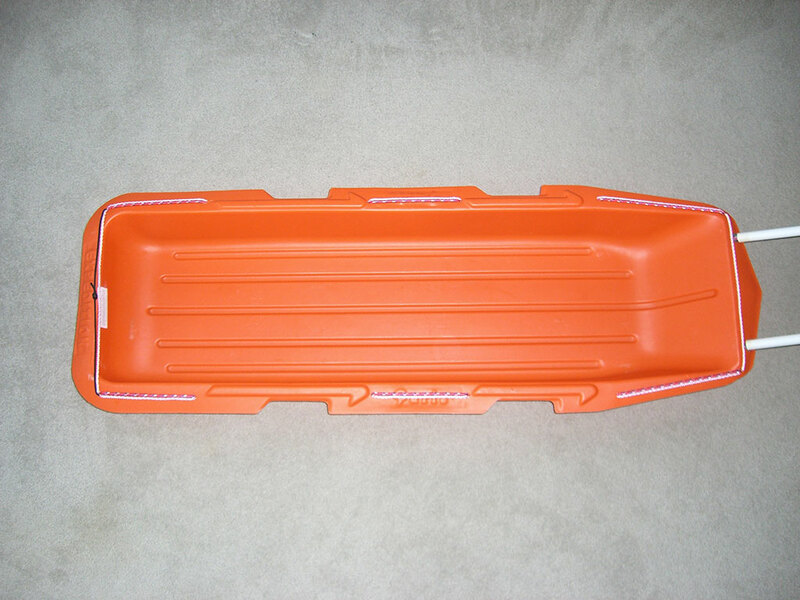 The Paris Expedition Sled is a tough lightweight sled designed as a pulk or gear sled. It helps move wood, and fishing, camping, or other gear easily over snow and ice. 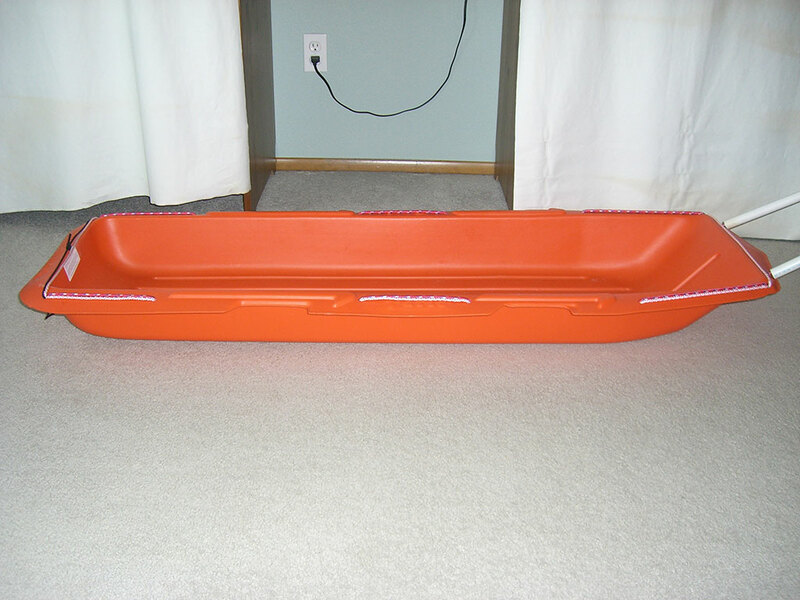 The sled comes in bright orange color. It features grommet-reinforced tow holes in the front with additional non-reinforced holes along the sides to secure cargo. The Paris Expedition Sled is sold by itself, without tow rope or poles, etc. The quality of the sled is fantastic. It is thick enough to remain rigid when full of gear and does wear out quickly. The pre-drilled holes provide plenty of tie down points and more can be added with ease. Its size lends nicely to being pulled while snowshoeing. Before taking the Paris Expedition Sled on a snow camping trip, I had to fashion poles that attach to a waist belt. 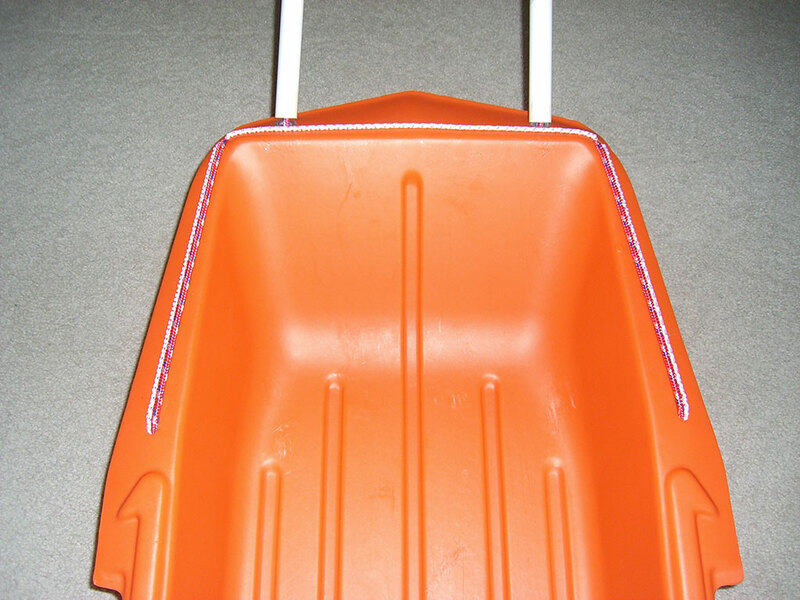 I began by threading rope through all the holes in the sled, with the ends exiting through the front reinforced grommets. I then ran each rope end through a 5 foot piece of 1/2 inch PVC SCH 40 pipe. Finally, I tied a loop in the end of each rope and attached a carabiner which then clips into my waist belt. I used a waist belt from an old backpack. One could easily attach the poles to the waist belt of complete backpack as well. I cross the poles before attaching them to the waist belt to improve handling. I normally load the sled with one or two 18-gallon tote bins to keep my gear dry. I secure these with bungee cords. I have used this setup for all my winter camping trips the past few years with great success. I have only pulled the sled while on snowshoes as I do not cross-country ski. The sled tracks right behind me and travels around corners well, provided the terrain is not too steep. I have been able to pull fairly heavy loads (approximately 60-80 lbs) uphill with relative ease (being in shape helps a lot). The sled tends to want to run into me on descents, but the poles do a good job of preventing this. The only issues I have encountered are a couple of tip-overs during descents on packed, narrow, sloping trails. Keeping the load lower helps, as would a more rigid pole system. When pulling the sled parallel to a slope and headed downhill on a packed trail it will sometimes slide off the trail down the hill (gravity wins here). Walking faster can decrease this tendancy. Attaching a rope to the back and having someone else control the back during descents works well as long as both people travel at the same pace. So far the sled shows very little wear. There are no cracks and the bottom shows little wear. My trips are normally over snow versus ice, so this likely plays a role in how well the bottom has held up. 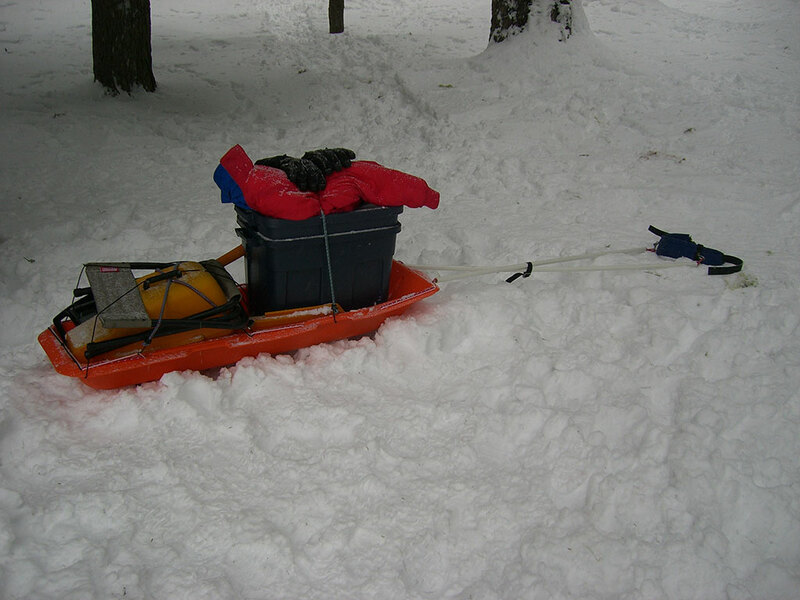 See "Backpacking In The Snow Near Birds Butte", "Snowshoeing to Twin Lakes", and "Snow Camping at Twin Lakes" where this sled was used. This has been a great pulk (gear) sled for my winter camping trips. It makes it much easier to bring lots of gear into the woods in the winter compared to a backpack. This high quality sled has held up well for three winters and should last many more. 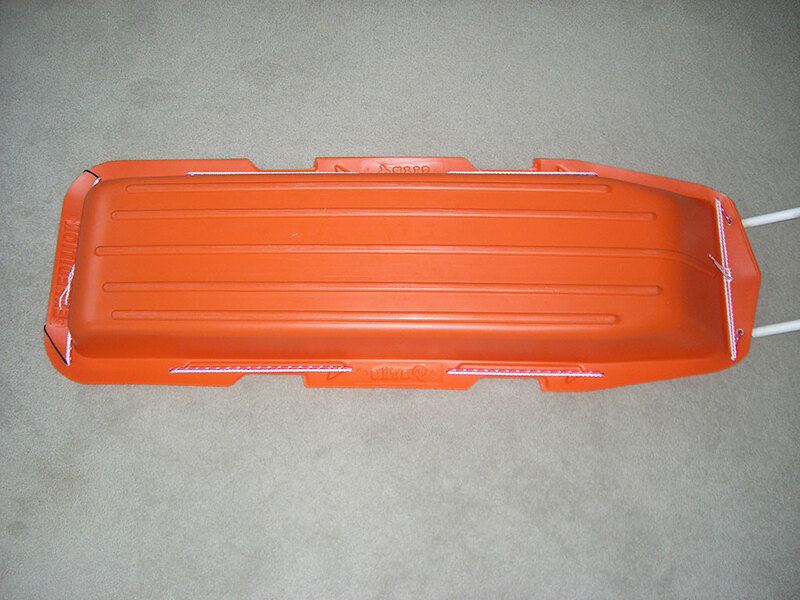 I recommend this sled to anyone looking for a good pulk sled for skiing or snowshoeing. Its narrow foot print and short sides can sometimes be problematic on steep slopes, but it was designed to be sleek and lightweight. Technique can help overcome any issues with handling. Be sure to fashion some type of pole system for pulling, as simply using a rope will cause control problems, especially downhill. See Ed's Wilderness Systems for pole details. I have never used my pulk on really steep ascents because I stay below treeline all winter; in the woods on valley trails. This is where I got a lot of my ideas. I made the "Chapter 3. The Simple Pipe Pulk" with a few mods. - used electrical conduit for the poles since I am not XC skiing and am not concerned about the poles injuring me in a fall. - added two cross pieces; the cross pieces are PVC tees that slide over the electrical conduit with another piece of electrical conduit between them. All connections are duct tape. It looks like a ladder with two rungs. - spent a little money to use climbing rope for the pulk system. Nice to have a 25-30 foot length of high quality rope with me with no extra weight penalty. - cannibalized a Kelty kid carrier for the harness. The load is on both shoulder and hips. IMO the less slop in the belt connection the better [less push pull tugging occurs]. I put my backpack in the pulk with a decent load in it. I try to put most of the "non-camping" day-hiking items in the backpack. So I could drop the pulk in an emergnecy and not have to sort through a million items. When it gets too steep and the pulk feels like it is pulling me back down the hill, I put the backpack on and put the harness in the sled. This distributes a bunch of the load to my body and makes the ascent easier. The penalty is i have both a harness and a backpack. I have a light weight 8x8 garden tarp that I use to keep everything in the pulk doing transit. I make a burrito with my gear as the filling and the tarp as the shell. I AVOID getting my pulk wet in river and stream crossings, the added friction is murder. I am thinking of buying xc ski wax or applying a can of PAM. Where did you find the sled? Where did you find the sled? Ive been looking for one. I found it at REI several years back. You might want to see if they can special order it for you. I have this sled. For preventing it hitting you while going down hill. I have a thick rope (12mm thickness) witha carabinier in each end, and about 150cm long. While pulling the pulk It just sits on top of the load, secured uner the bungees. Each end is secure to to the front sides, on the rope that I have around the pulk. When prepping to go down hill, I simply stretch the rope under the pulk, instead of on top, in a U from the front, under the pulk at the rear and forward again to the front. this acts as an effective brake and the pulk will not slide forward unless I actively pull it.